Southern Matriarch: I will not be defeated! Houston we have liftoff! I was not going to let that machine get the best of me. I still have a long way to go, but at least I have something to show for my efforts. And to answer a few commenter's question, I have an older model Babylock Esante embroidery machine in addition to my Bernina 1130. This machine came to live with me out of the generosity of a friend who wasn't using it. The center burpcloth you saw in this post. The border fabrics were all from my stash. On the center cloth I used a cotton gingham and trimmmed it with a grosgrain ribbon. I used a soft waffle pique for the band on this cloth and trimmed it with a wide satin ribbon. Babies love satin bindings. This one is a wealth of textures, the texture of the diaper with the embroidery, the pique and the satin. I was also determined to achieve an applique. Now I have done machine applique for years, shoot, I must have sold 500 garden flags in the day. I can satin stitch on my 1130 in my sleep. The steps involved in the embroidery machine applique were another skill to learn. Check! I used a sweet elephant. This baby's namesake collected elephants so it is only fittin'. A floral cotton was used for this band, again trimmed with a satin ribbon. I had to stop myself from getting out the Swiss eyelet to trim one of them with. There is a limit to everything and $12 a yard Swiss edging is a little over the top for a burpcloth! 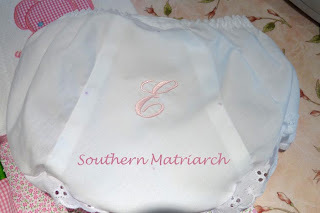 To top it off, a simple monogram on a diaper cover finished off the day. Another skill, how to get that diaper cover on/in the hoop without taking it apart. Check! All of these are simple designs, pretty simple techniques and I have a lot more to learn, but it is a start. Have you learned something new today? So beautiful! I learned something new this week. My serger 'broke'(turned out to be a bent needle). So I learned how to make french seams! Easy peasy, clean looking but a little bulky. But at least I could sew! I feel your pain girl! Good work taking an obstacle and turning it into an opportunity. I learned a lot this week, but nothing that really pertained to sewing. Thank goodness there are a few days left in the week for that! I learn new stuff every day, but I don't always really learn it, if you know what I mean. Sometimes I just have to learn from trial and error. Your burp cloths are adorable and so is that diaper cover. I've got to get one made as soon as I get off the computer today. I learned my friend Martha is a wonderfully strong woman who stitches by hand and machine beautifully......oh wait, I already knew that! I hope to learn how to do shell stitch by hand before the week is out! You're doing a great job! They look precious! I was intimidated by my machine - so many fabrics, threads, programs, and which stabilizer to use! Just keep trying new things and have fun! LOVE your burp cloths and a mom can't ever have enough of them handy! As soon as we know if it's PINK or BLUE that's due in October, then I will be making a stack of them too! I love the diaper cover too! I don't know how long you have been embroidering, but the outcome looks great. I do have a tip for you. 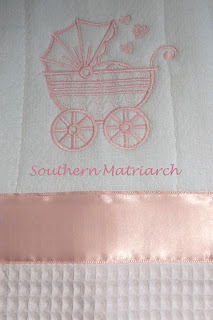 If you aren't using polyester embroidery thread for baby items, you should. Over time, the rayon thread will fade & definitely, if bleach is used. Sulky makes a great poly thread, but not as easily found as Rayon. Gorgeous work. I don't think I've learned anything today. Too busy doing repeat work for some reports that have to be done regularly. great burpies!!! I made lots of those for my grands too!! glad you have mastered that embroidery machine. 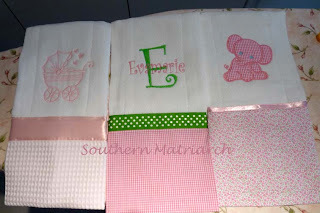 You will lots of fun doing appliques for outfits too!! These are darling and will be so well used! I envy you the ME machine! Someday... We call those byedies in this house. V-Rose named them when she was 12 months old! I made her very fancy ones with ribbons and eyelets and laces. Oh, my! In my defence, I waited 20 years for her! She slept with one for YEARS! Thank you for the sweet memories. You have inspired me to do my first burpcloth for my grandma's hope chest. 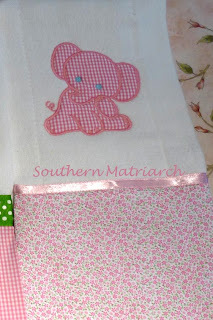 Do you do the embroidery and then add the ruffle and ribbon or do you add a backing to the reverse side of the burpcloth? Also, I love the pram embroidery. Where did you purchase it?